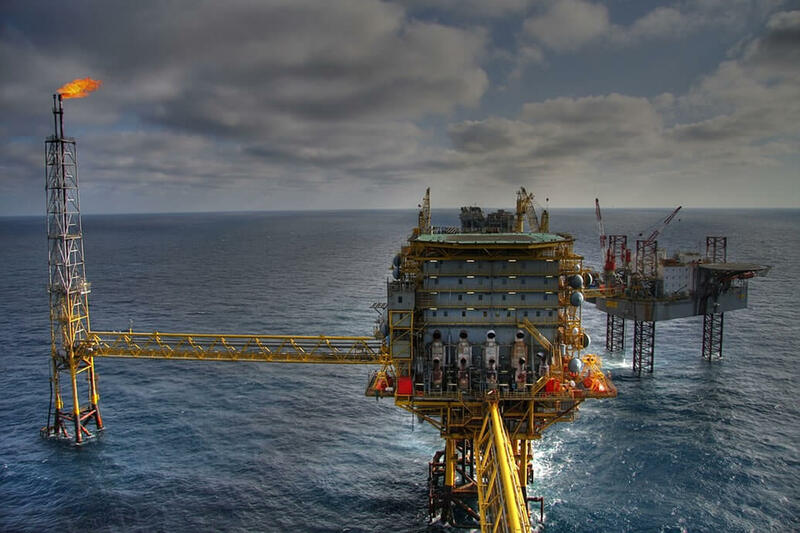 Many Oil & Gas installations, especially oil rigs and FPSOs, are located in areas where there are very harsh weather conditions, such as the North Sea. Weather conditions can reach extremes with very low temperatures, very strong winds,snow and ice. In these environments, Flame and Gas Detectors have been installed. The Skarv Oil Field, located between the Norne field and Heidrun, and the Schiehallion Oil Field are both located in the North Sea where these extremes prevail. Also facing tough conditions are oil fields and facilities in the Prudhoe Bay area in Alaska. Although a different area of the world, similar tough surroundings are facedat the other end of the spectrum, there is extreme sunlight, high temperatures coupled with occasional sand storms. In all of these locations and many other industrial areas, there is a variety of background IR or UV radiation sources, some of which may be of high intensity, and must be differentiated from radiation emitted from a fire. These environments provide difficult conditions within which optical flame and gas detectors need to operate. Extreme surrounding conditions can be directly linked to the regular triggers of false alarms. The results from a false alarm are significant due to a loss of confidence in the detection systems and the cost of initiating emergency procedures unnecessarily – it is therefore essential that flame and gas detectors are not activated by surrounding environmental factors. To meet the safety requirements of these facilities, reliable Optical Flame Detectors can be installed to provide, even under these harsh conditions, fast and reliable fire detection, and Open Path Flammable or Toxic Gas Detectors can be used to detect the presence of any gas released before the concentration reaches a level which will cause fire, explosion or risk to personnel. These flame and gas detection and monitoring systems are able to work at the highest levels in spite of extreme conditions, remaining unaffected by different climates and providing a constantly high level of performance and reliability. It is due to all these conditions that the Oil & Gas industry requires detectors to be tested, certified and therefore carry the necessary approvals, to ensure that they are of the highest standard and ‘fit for purpose’. Some key approvals required are hazardous area Ex approvals (FM, CSA, ATEX, IECEx, Inmetro, CU TR), functional approvals (FM, EN), and eliability approval (SIL2 TUV). The Interference IR sources that are constant or vary very slowly, for example heaters, lamps and the sun. IR sources which vary periodically or sporadically, such as flashing lights, vehicle lights, etc. Flames themselves are modulated so it is difficult to determine the real flame. Solar radiation Any material obstructing the detector’s window or acting as an optical lens, such as sea salt, raindrops, etc. The Solution Detectors designed to only measure the modulated part of the IR radiation, therefore ignoring these triggers. Measuring radiation in more than one waveband allows determination of a real flame. Including a detection band in the solar blind UV, a part which is blocked by the ozone layer in the upper atmosphere. An automatic self-test can determine real fires from some of these triggers. Raindrops, for example, cannot be detected this way. So detector design is the only way to ensure false alarm immunity here. There are various optical flame detection technologies which, while working on the same basic approach, detect at different optical wavelengths and therefore detect different types of fires. The two main types of optical flame detection used in the Oil & Gas industry are combined UV/IR and Triple infrared (IR3) detection. UV/IR Optical Flame Detection is dual spectrum and uses a solar blind UV sensor with a high signal-to-noise ratio and a narrow band IR sensor. UV/IR detectors are fast, especially in response to flash fires, and have good false alarm immunity. The UV sensor is a good but overly sensitive fire detector, so the IR sensor which works at 2.7µ or 4.3µ spectral ranges which are characteristic of a fire, complements this and provides the confirmation of a real fire. The end result is very fast fire detection with high reliability. IR3 Optical Flame Detection uses three IR sensors to monitor the chosen area, where one sensor detects the infrared radiation emitted by the hot CO2 product of a fire and the other two reference sensors are sensitive to background radiation at a longer and shorter wavelengths, both analyzed to ensure that the patterndetected matches that of a real fire situation. IR3 detectors can detect at very long distances and have excellent false alarm immunity. This technology, which was patented by Spectrex in the 1990’s and was a major breakthrough in modern optical flame detection , allows less detectors to be employed for a specific area, saving cost, and the detectors can be placed in the harshest of environments without being triggered by the exteme environmental factors. An IR3 detector can detect a standard 1ft2 (0.1m2) gasoline fire at a distance of up to 215ft (65m). The choice here depends, as always, on the application. For high risk industires, they need the most robust detector that is the least susceptible to costly and misleading false alarms. The Triple IR technique has the hiighest immunity to such false alarms and offers much greater detection distances (for a 1ft2 (0.1m2) gasoline fire, 215ft (65m) compared to only 65ft (20m) for UV/IR type). As a result, they are widely specified for high risk applications. In addition, in large or open areas, this greater detection distance is also a means to reduce detector numbers (including cabling, control panel loops etc) and thereby the overall cost. However, there are many other lower risk applications where distance is less of a factor, where UV/IR detectors are more than adequate for the job and where their lower cost is also an attraction . The Spectrex SharpEye range of optical flame detectors includes a wide variety of technologies to offer a solution for any application with top performance and minimal false alarms. IR3, Multi IR, UV/IR and ultra fast response versions are among the SharpEye 40/40 range of detectors. Open Path Gas Detection, also known as Line-of-Sight Gas Detection, is a reliable method of flammable gas detection able to measure gas concentrations at distances of up to 660ft (200m). Open Path Gas Detectors are able to detect these flammable gases at low concentrations, as well as high concentrations. When a gas leak occurs, a gas cloud is formed with the concentration reducing as the edges of the cloud are reached, so any part of the gas cloud can be detected by open path gas detectors. It is important to detect a gas hazard before it causes a fire, so that neutralizing agents can be deployed before dangerous concentrations are reached. Open Path Gas Detectors allow for wide area coverage and a very high speed of response. The detectors comprise a transmitter and a receiver, placed at a predetermined distance from one another. The transmitter projects a beam of light radiation to the receiver. When flammable gas passes through the beam, it absorbs the light radiation thereby reducing the signal at the receiver. These signals are analyzed and output signals are provided to a control system. Spectrex patented the Xenon flash bulb which revolutionized open path gas detection, allowing faster response times and much greater false alarm immunity. To ensure that background radiation sources, such as sunlight, humidity, rain, fog are not confused with the detector’s beam, possibly causing a false alarm, the transmitter emits short, high intensity pulses of light in a unique pattern which the receiver is able to recognize and therefore distinguish from any other background radiation sources. Spectrex SafEye Open Path Gas Detectors provide high reliabilty solutions to superior gas detection in the toughest of conditions, providing, without fail, the best protection no matter what conditions are faced. The SafEye 900 is complemented by the duct mounted detector for air / turbine ducts, and these have recently been joined by the SafEye 950/960 Toxic Gas Open Path Detectors, detecting , among others, Hydrogen sulphide and Ammonia at ppm levels.